Deb's Cup of Tea: So Good. So Gone. It's hard to impress me with a chocolate chip cookie recipe. I mean, really. Butter, sugar, eggs, flour, soda, chocolate chips. 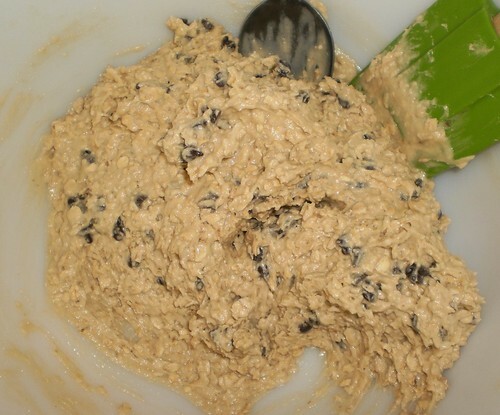 I have a recipe I call "Deb's Dump Cookie" because I add oatmeal, walnuts and raisins; dumping in anything I can find. But the basic dough is the same. I found a recipe that just might be my new favorite. It's got oatmeal and I didn't have any regular size chocolate chips, so I added mini ones, which I actually think I like better. What's so special about this? 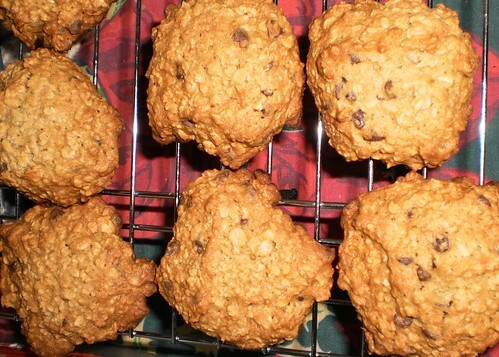 These are Banana Oatmeal Chocolate Chip cookies. One ripe banana is added to the dough. I don't know if adding the banana was what did it, but my chocolate chip cookies have a tendency to spread. Instead of chewy, I get crispy. Sometimes that's fine. The crispy ones tend to hold up better when dunked. But I like chewy. These were marvelous. The recipe made about 3 dozen which are all gone. I'm not ashamed to say I ate them, all, every last one. They were so good. I now have another use for an overripe banana besides banana bread. I attempted to keep some of these for "later". I made them after the Iowa game on Saturday. I had a good supper and then cookies for dessert. During the evening's World of Warcraft raid, I had cookies. During Sunday's dishes and cleaning, I would have a cookie to keep going. I had exactly 4 left to munch on during last night's raid. These are so easy to make but I'm thinking I probably ought not to buy bananas very often. Cookies, even with milk, are not a well-balanced meal, not even if I hold one in each hand.